Is it really the fourth Thursday of June already? That means it's time to join the Gratitude Circle and link up with Vidya Sury. If you care to join in, you can pick up the badge below. Please be sure to read Vidya's post here: Vidya Sury - Focusing On the Good Stuff. Now, on with my list. 1. For my ability to swim. 2. That I am writing a lot with Alan Watt's "The 90 Day Novel". 3. To have a hardworking neighbor who conscientiously cleaned a messy water leak for a fair price, actually enabling us to bypass an insurance claim. (Thanks, neighbor Dave!). 4. For having harvested several delicious tomatoes already. 5. To be financially well off enough that the new water heater and cleaning the basement did not drain our bank account. Well, I hope you find many blessings in your day. And please share them in the comments! I'm so excited to have joined a daily novel workshop created and published by author Alan Watt - "The 90 Day Novel". Some friendly local authors will be meeting weekly during this summer project, and now I'm actually facilitating the workshop online! This is a new venture for me. It's my hope to encourage creativity in others as well as to write a complete novel length manuscript over the next three months. Whatever happens, I like the idea of getting on the page and having fun telling story. Thankfully, I have an emotionally safe place for my debut facilitation. 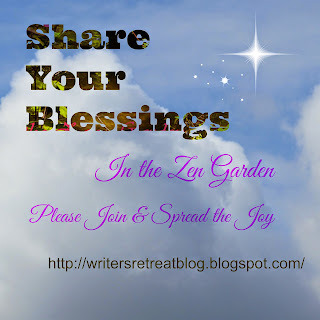 The Writer Zen Garden has been my online home for many years now. The people are talented, open-minded, and generous. Let's hope I do right by them. It helps that Alan Watt seems to have the same gentle approach to creativity as Julia Cameron. And my beloved Zen Garden forum group has not only invited me to join in on Ms. Cameron's various workshops but encouraged me to guest host one. Writing some of those essays gave me a little experience, at least. Do you have any exciting plans over the coming months? Today I was honored to find myself nominated for the Liebster Award. It’s sort of a blog hop party but in the form of a chain letter. Before that notion turns you off, think of this as a way to meet other bloggers. I look forward to it, having enjoyed the A to Z Blog challenge in April. For my involvement I’d like to thank the delightful Strayer, an advocate for stray cats in need. Her blog, Cat Eyes --- A Cat Woman's Photos, includes some really great photos as well as stories, both about cats and life in general. Stopping by is certainly part of my daily routine. I hope you’ll visit her. 2. Give readers 11 random facts about yourself. 3. 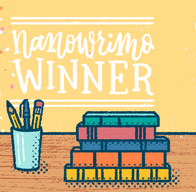 Answer 11 questions from the blog of the person who nominated you. 5. Nominate 5-11 bloggers for this award (those with fewer than 200 followers is recommended). 6. Come up with 11 questions for your nominees. 7. List these rules in the post, along with said nominees and the questions you wish them to answer. 8. Last but not least, notify your nominees. 9. And, of course, have fun! Having achieved the first and seventh steps, I will now offer 11 random facts about me. 1. I have had two-tone dyed hair since before the style became popular. 2. My most complete music collection is Marilyn Manson. 3. If I won the lottery, I’d open an animal shelter. 4. I usually prefer the company of animals to people. 5. Most of my life was spent in denial that I am a science fiction geek. 6. Resistance training is my second favorite form of exercise behind swimming. 7. I want to invent a force field that lowers gravity immediately around a person’s body for both safety and convenience. 8. It just occurred to me that the aforementioned invention would also be a fantastic beauty tool (!) – no more sagging. 9. The ocean is my favorite type of vacation spot. 10. One goal is to learn something new every single day. 11. I can go days without Internet access and not feel deprived. 1. Cats or dogs? Well, my partner prefers cats, so we have feline companions but I greatly appreciate most dogs. 2. Your favorite book? Ooh, that’s tough. I suppose I’ll go with Stephen King’s “It” which I return to every few years, but Mr. King’s “The Stand” is a close second. 3. Your favorite movie? That would have to be “Cousins” with Ted Danson and Isabella Rossellini. 4. Mass transport commute or your own car? My own car, for sure. I don’t like crowds and really enjoy freedom of movement. 6. Noise or silence? Silence is golden. As much as I love music, it’s rarely played loudly. 7. Crowds or Alone? I definitely prefer being alone. It doesn’t matter if I’m in a lake, on a mountain trail, or sitting at home. I’ve even attended movies and concerts by myself. 8. Have you ever been to a county fair? Absolutely! They are fun even now that I’m grown up, though I hate that they always happen when temperatures are high. 9. Jet ski or kayak? I would probably prefer a kayak, if only for that noise issue. Interesting question! 10. TV or book? I much prefer to read, though I do adore movies. 11. City or country? I’m definitely a country girl for the most part. However, I have enjoyed visits to St. Louis and Chicago. Now I will list my nominees in alphabetical order. I hope they have the time and inclination. And here are the questions which came to my mind. I’ll be interested to read how any takers of my nomination respond. 1. Do you prefer rainy days or sunshine? 2. Have you ever been to an opera? 3. Would you prefer to say you climbed Mount Everest or took a deep sea dive? 4. Are you afraid of spiders? 5. What is your favorite morning beverage? 6. Would you rather walk or ride? 7. Do you own a motorcycle, or would you perhaps like to? 9. Would you prefer attending a music concert or a comedy show? 10. What is the last book you finished? 11. Which would you choose, a romantic comedy or a horror flick? Now, I’m going to devote myself to the first exercise in “The Ninety Day Novel” alongside some local writers. Should be a fun summer project.